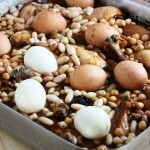 Cholent Stew is a Moroccan food recipe baked with eggs and dumplings. Heat oil in pot over medium heat and add onions and saute until soft and translucent, 5 to 10 minutes. Add, without mixing, the chickpeas, garlic, bones, meat, potatoes, honey, paprika, cumin, cinnamon, turmeric, salt, and pepper. 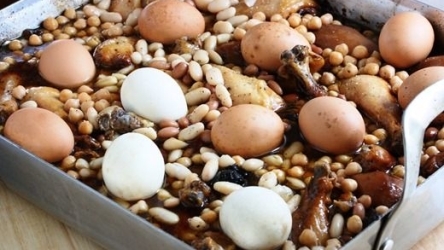 Place the dumplings in the pot and the eggs around it. Add enough water to cover. Cook in a slow cooker over night.